We arrived smoothly at Fumicino at 8 am. As we made our way to Alison & Jed's apartment, near the Vatican, we encountered incredible crowds, all civil enough, but pushing and shoving all the same. I was momentarily frightened I would fall onto the tracks. What on earth is bringing all these people into the subway on a Sunday morning? we thought. After a few false starts, we were relieved to find Alison and Jed's apartment--an oasis, truly! The courtyard is spilling with green plants and scents of old dampness. Alison and Jed were waving to us from their balcony. Inside, their apartment is large and airy, with big windows and an open, colorful kitchen. We got settled and they offered to take us on their special "first day" tour. 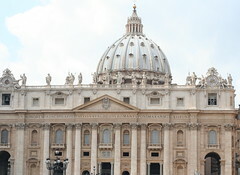 We stopped for a coffee and made our way towards nearby St. Peter's. The whole way exclaiming over the people! the crowds! "But this can't be normal!" we say. "No!" they claim. 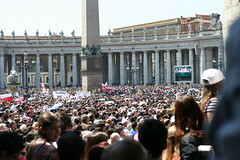 We arrive at St. Peter's square to discover... The POPE! We laugh, the mystery is solved. It is a special priest ordination day. We take many photos and listen to his speech. He apparently isn't addressing my issue of Easter dates today. Then we followed the escaping crowd down to the river and begin our sauntering, caffe-saturated reunion with old friends and with Rome. 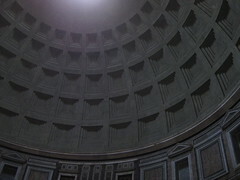 It was a warm, sunny day, perfect for cool alleys and making the Pantheon seem even more otherworldly: light piercing through the oculus into the cool interior. 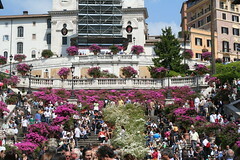 The Spanish Steps are covered in bright pink azaleas and many, many people. 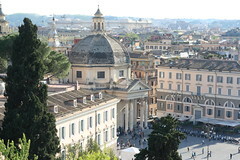 We opt to "see and be seen" in Piazza del Popolo instead. So many people! Even a bride and groom! 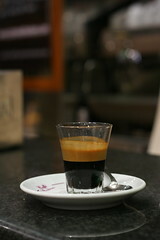 Another caffe and we are fortified to climb up into the gardens of Villa Borghese. It is a gorgeous view of Rome, although I am somewhat distracted by the barely-existent possibility of one of us falling over the wall to our deaths. We climb down and begin our walk back. Rest and book reading and then it's time for dinner: Pizza! Not just any pizza. Glorious pizza with crunchy chewy crust and fresh mozzerella. Brent is so tuckered out he falls asleep at the table. So we finally shuffle back home and crawl into a cozy bed made for us in the living room. We sleep in and it's wonderful. Today, we decide, is going to be a meander through the streets kind of day. Just soaking up being here. I buy some Italian wool yarn ("Fila"--we looked it up in Alison's pocket dictionary) in a lovely soft pink, some olive oil, honey, jam, and a little notebook for my purse. 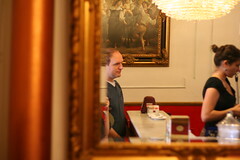 We meet up with Jed (who has been slaving away while we are out) for dinner at a restaurant near their place. It is mountains of food! Heaps of food! The waiter is so friendly. We just die laughing when he spends 30 seconds describing the second course in Italian, we politely say, "Scusi?" and he says, in English, "MEAT." Back to the apartment, where we are introduced to Set and Yuker, two new-to-us card games. We are up until the wee hours of the Roman night. I felt driven to do some sightseeing--so Brent, Alison, and I make a plan and start off. No, wait, we need some coffees. Ok, now we're ready! Oh, wait, we forgot the map. Jed can throw it out the window into the street. Oh, wait, wouldn't pizza be good right now? NOW we're ready! We arrive at the Pyramid/Cemetary subway stop. You know what sounds good right now? Coffee! Then we are finally sightseeing, which we ardently do until the cemetary closes--visiting Keats' tomb and see so many other interesting stories represented. We walk to the keyhole, where we are treated to an astounding, completely unexpected (on my part) view of St Peter's dome perfectly framed by arching trees. Two Italians arrive on their scooter for a peek. (For some reason I found this highly amusing). We pop into several churches. Brent lights a candle in an especially simple and pretty one for Bella, so she will know that we are thinking of her. We see an absolutely gorgeous view of the Roman skyline from the Parco di S. Alessio. We cut through the Roman Rose Garden. 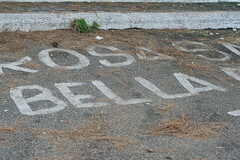 We saw a Roman love note that involved BELLA written on the pavement 2 feet high. All the while, successfully avoiding being run down by scooters! 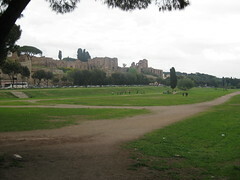 We next visited the Circus Maximus, which I almost didn't see at first, so distracted was I at not being run down by scooters, but there it was--a large ditch. Impressive only to those with fertile imaginations. We sightsee on. 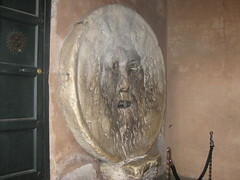 Next stop is the Bocca del Verita-Mouth of Truth, which is closed, but that is fine with us since we are always satisfied with a picture, this time snapped through the gates. I am hungry... Alison leads us to the Campidoglio, where we eat divine gelati on our same picnic spot from 2001. We discover that that picnic is one of all of our favorite memories. So we linger and observe the traffic and tourists and all the Roman hustle bustle. We call Jed and arrange to meet him at Maccheroni for dinner in a couple hours. Next destination, Turtle fountain! I'm not sure why, but we always call it "Turtletown." We love turtletown and when we arrive on foot (Alison with friendly cats trailing in her wake--Crazy Roman Cat Lady) there is an accordian playing off in a corner... wafting accordian, what could be more perfect? We linger. Then we mosey to Campo di Fiori, which is thronged and presents to us her most seedy side, since it is dinner and every restaurant has their English-speaking "hook" planted outside to hustle you in. We hustled out. Stopping at Il Forniae, we saw a man buy a slice off a sausage of Mortadella that was at least 15 inches across. Here we hear from Jed--there are bugs. (In his software project, not the mortadella) so he can't meet us for dinner after all. We are so sad without him, but the restaurant is so much fun, supplying us with a half liter of free wine, and we are feeling a little better. After dinner we get free coffees and panna cotta and we ask ourselves, "Who's Jed?" 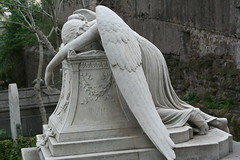 all disappointment forgotten. We walk back to the apartment and agree, sightseeing is too exhausting. Tomorrow we will take it easy! 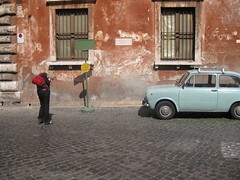 Today we wound our way to and through the Trastevere neighborhood. In our attempt to take it easy, we eneded up meandering for miles and miles. Which was, of course, lovely. We had caprese salad (Brent had "Italy's best lasagna") and after that stopped for caffes at a chocolate shop and there were little chocolates in the bottoms of our espressos. Yum! We shopped around, but nothing serious. We saw a movie theater that appeared to serve prosecco, which we thought sounded GREAT, but was showing Saw IV. We crossed the river by way of a tiny island with a gelato shop and a hospital and wound our way home via some scenic streets. Alison stopped to buy tiny espresso spoons and together we were able to successfully navigate an Italian fabric store. We shuffled home, quite tuckered out. We had planned on fortifying ourselves to go out again for dinner, but the best we could do after a couple glasses of happy hour was to go downstairs to the Kabob place. We played cards, quite ferociously, for several hours. Just like old times. I got an email from my mom that dad was pulling Bella around in a new wagon and she is loving every minute of it. Today Brent and I decided to let Alison and Jed have a morning to themselves, so we ventured out to lurch through the city unescorted. We successfully managed to buy ourselves caffes and then walked along the now familiar route to St. Peter's Square, where we literally basked in the sun by lying on the stone steps. Watching everyone lining up to get in S. Peter's got us in the mood to explore, so we went in and looked around. It certainly spoils all other cathedrals, it is not to be topped in magnificence and grandeur. 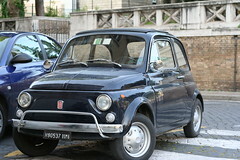 It's an Italian holiday, Il Primo di Maggio. A lot of things are closed but we thought, the Romans must do something. 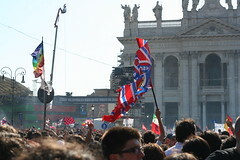 Apparently there is a big rock concert in Rome, so we go to that, and voila! There are all the Romans! Or at least the young ones. We had a good time listening to the music and observing the throngs. My favorite part was when a band (The Blue Beaters) sang "Ciao Bella!" and there were what seemed like thousands of people singing along. Wow! Definitely a memory I will have forever. 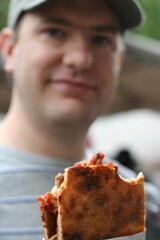 We ate pizza with hotdog and olives on it when our rumbling stomachs finally tore us away from the entertainment. We ate sitting on the curb in the shade and nothing ever tasted better. 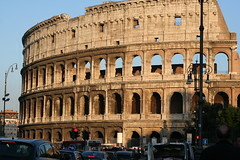 We decided to walk down the street to the Colosseum, because although we had been near it several times, we hadn't actually seen it and that seemed weird to visit Rome and not even glimpse the Colosseum. We walked up right when the light was all glowy and red and it was amazing. We got a caffe and took the overcrowded subway back to the apartment, where Brent and I promptly fell asleep until dinner. Our last full day in Rome! Already?! We are thrilled to have Jed with us, he has secured the day off to spend with us. 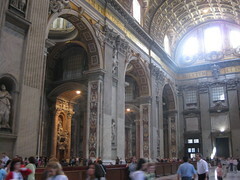 The four of us started out thinking we would go to the Cupola of St. Peter's--um, 2 hr line? No thank you! So we proceeded directly to relaxing. Perfect! We went to Alison and Jed's grocery store, which was about what you'd expect except they take the cheese pretty seriously over here, and apparently they feed their babies bunnies. BUNNIES!! Jed bought all the ingredients for Spaghetti Bolognese. Alison and I stopped in a kitchen store (Moa) and I loaded up on gorgeous souvineers. Brent and Jed ran all of our loot back to the apartment and we decided to mosey towards bustling Piazza Navona, which I love because you can watch live artists. On the way, I decided to fulfill my fantasy of having a Roman haircut! It was such an adventure! Even just the shampooing was different... much more massagey and longer lasting than a typical American shampooing. The stylist even did my makeup! I emerged looking bellisima! 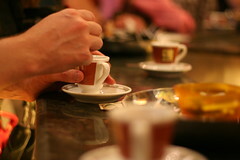 We met back up with the men and it was time for a caffe at Tazza d'Oro. We attempted to find the Time Elevator, but gave up and had drinks stead. We saw the cutest little dog, first at Trevi fountain, and then, surprisingly, several other times around the city. At Trevi fountain, I threw my euro coin in so I could come back to Rome, but had to carefully aim so as not to bonk anyone of the thousands of people flocked around. We settled down for drinks in view of the Pantheon, as a capstone to our day, when suddenly Jed was struck with his lack of carrots for the bolognese! We held down the drink table while he ran and bought some (apparently very easy to find in the historic center of Rome)! We walked home, having spent an absolutely lovely day all together. 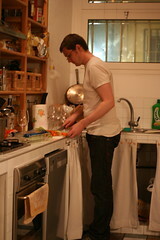 Back at the apartment, Jed began industrially cooking dinner. Where he got the energy, we'll never know! We had an UNBELIEVABLE dinner, a magical memory of our trip. 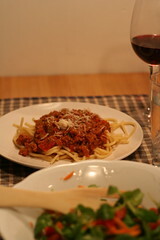 It was so cozy to have the apartment smell like simmering sauce while we sipped drinks and reviewed our week in Rome. After dinner we walked down the street to the Alexanderplatz Jazz Club, where we sat at the bar in a subterranean time warp and listened to some frenetic jazz for not nearly long enough until they closed. Back at the apartment, Alison and I are in for a surprise when those sneaky men trot out a birthday cake for us! 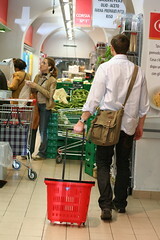 They had bought it and squirreled it away while we were shopping in the kitchen store. The cake and the wine and the cozy apartment and being together with much missed friends, it was an untoppable last evening. Thank you Solitaire! Those links are perfect! We looked for ourselves in the Primo Maggio video but alas--we were waaaaay further back than they show. How exciting to hear from a real Italian! !